Army Sergeant David A. Stephens, of Tullahoma, Tennessee, was assigned to the 2nd Battalion, 508th Parachute Infantry Regiment, 4th Brigade Combat Team, 82nd Airborne Division, Fort Bragg, North Carolina. SGT Stephens was carrying out combat operations during Operation Enduring Freedom in Miri, Afghanistan when an improvised explosive device struck his vehicle. SGT Stephens, age 28, as well as Staff Sergeant Casey D. Combs, were both killed that day on April 12, 2007. A 2002 graduate of the University of Tennessee-Chattanooga, David Stephens earned a bachelor’s degree in Abnormal Psychology. 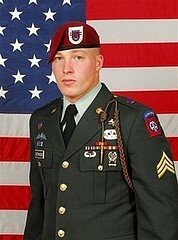 Three years later, in March of 2005, he joined the Army. At one point he was selected to attend Officer Candidate School, but rejected the offer to become a medic. His mother had died of a heart attack and he wanted to help people. “Sgt. Stephens was an inspiration to all the paratroopers of his unit,” said 1st Lt. Dennis Curry. “He always volunteered to help others.” During his service he received the Bronze Star, Purple Heart, and the Combat Medic Badge. SGT Stephens was known for being a humorous, caring, good friend - and a Bob Dylan fan. His wife said he even brought an iPod filled with Bob Dylan’s music with him on deployment. He is survived by his wife and daughter who was only 3 months old when he was killed. His daughter is a Folds of Honor scholarship recipient.